Should Hillary challenge Pres. Obama in 2012? It could be the greatest of rematch of all time. Hillary Clinton and Pres. Barack Obama nearly tore the Democratic Party apart two years ago. What if they go at it again in 2012? Clinton's numbers have improved since the 2008 primaries... and she fares better than Pres. Obama, who gets a 57 percent favorable rating; but his job approval rating is below 50 percent in most of the major polls. Obama's unfavorable rating of 41 percent has more than doubled since early last year. There's more: Clinton's numbers also top all other Democrats and Republicans in this poll... including potential GOP presidential candidates like Mitt Romney and Mike Huckabee. Clinton insists she's "absolutely not interested" in running again for president... although she has suggested that she doesn't envision serving as Secretary of State in a second Obama term. Of course a lot can happen between now and 2012... including whatever Pres. Obama does or doesn't accomplish in the remainder of his term. If the economy recovers and the jobs come back, he could be tough to beat. But as of right now, one survey shows a majority of Americans don't think the president deserves a second term. And when it comes to politics, it's probably wise never to count a Clinton out. Here’s my question to you: Should Hillary Clinton challenge Pres. Obama in 2012? Hillary Clinton as Supreme Court justice? First Lady... Senator... Presidential candidate... Secretary of State. Hillary Clinton's resume is already an impressive one ... but what about Supreme Court Justice as her next step? Republican Senator Orrin Hatch of Utah first floated the idea... saying Clinton "would be an interesting person in the mix" ... as a replacement for retiring Supreme Court Justice John Paul Stevens. But it's not such a far-fetched notion... and some Clinton supporters love it. Longtime adviser Mark Penn tells Politico that Clinton would make a great justice... that she would "bring a revolution to the court and would be confirmable." Even her mother has talked about the scenario... once telling a reporter she thought Hillary would be the first woman to serve on the high court...she says she was "kind of sorry" when Sandra Day O'Connor became the first. It's also worth pointing out that since the retirement of O'connor - the Supreme Court has been made up entirely of career legal scholars and jurists - not a single prominent public figure... in the tradition of justices like William Howard Taft, Earl Warren and Thurgood Marshall. A nominee like Clinton could change all that. Here’s my question to you: Why shouldn't Pres. Obama consider Hillary Clinton for the Supreme Court? 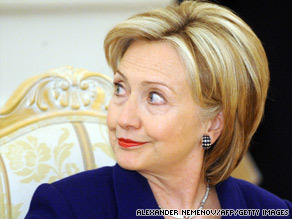 Do you believe Hillary Clinton won't run for president again? 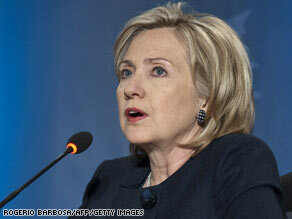 Secretary of State Hillary Clinton said "no" three times when asked if she will ever run for president again. Clinton now works for the man who defeated her in that bruising series of primaries for the Democratic nomination last year. She told NBC News her job as President Obama's secretary of state is great, but "It is a 24/7 job. And I am looking forward to retirement at some point." 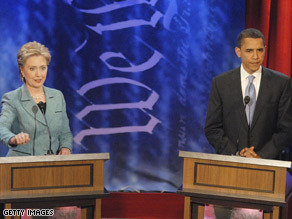 If Clinton changes her mind - she would either have to run against President Obama in the Democratic primaries in 2012... or she would have to wait until 2016. She turns 62 this month. Hillary Clinton is also denying that her voice isn't being heard in the Obama administration... calling that "absurd." She says that it's not her style to try to be the center of attention... and that she believes in delegating power. Clinton says she wants to be a positive force in enacting the changes that the Obama administration believes in: "But that doesn't mean it all has to be me, me, me all the time." Of course - we've seen many examples of politicians who swear up and down that they're not going to run for office - like president, but things change somewhere down the line. And when it comes to the Clintons and their political instincts... many believe it's a bad idea to ever count them out. Here’s my question to you: Hillary Clinton says she won't run for president again. Do you believe her? Should Bill Clinton’s Financial Affairs Prevent Hillary’s Secretary of State Confirmation? Senator Hillary Clinton intervened 6 times in government issues that directly affected companies or individuals who became donors to her husband's foundation, according to the Associated Press. Should the Clinton Foundation's ties to foreigners affect Hillary Clinton's nomination? This raises obvious questions about the potential for ethical conflicts that could arise in her official business as Secretary of State. Christopher Hitchens at Slate.com calls into question whether Hillary Clinton should have been nominated for the post at all. The article points out that everyone around the world knows that you can get the former president's attention through his foundation. Not a problem in itself but when you factor in that he's the confidant to the would-be Secretary of State, someone she's sure to rely on since she has no foreign affairs track record of her own, it can become one. The foundation has agreed to disclose its list of confidential clients and every year new donors from foreign states could be subject to the scrutiny of Obama administration lawyers. Here’s my question to you: Should the foreign financial affairs of Bill Clinton's foundation be enough to prevent Sen. Hillary Clinton's confirmation as Secretary of State? Proper role for Sen. Clinton in Obama’s Admin.? 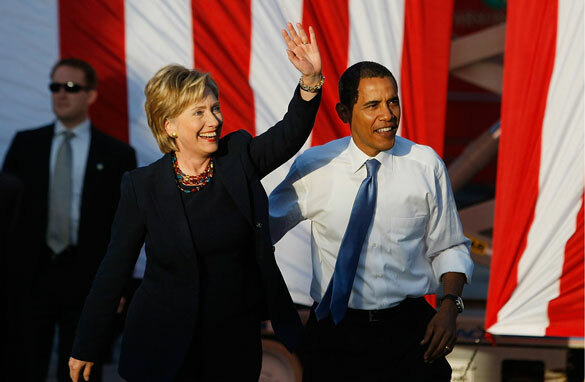 President-elect Barack Obama met with Senator Hillary Clinton last week, and since then, a lot has been made about the possibility of Obama's former rival becoming his secretary of state. The big question this week is what sort of problems Bill Clinton could cause in the vetting process of his wife. Since he left office, President Clinton has started a new career which involves some "complicated international business dealings." He also has a global foundation with a long list of donors who may not all agree with incoming President Obama's policies. But the Clintons have been here before. If Hillary gets the "all clear" and is offered the job, the next question is: Should she take it? After losing the democratic presidential nomination to Barack Obama, Clinton returned to her old job as the junior senator from New York. She's very popular with her constituents and could likely remain in the senate as long as she wants to, perhaps even becoming a senate leader. But if she takes the Secretary of State job, she will tie her career to the successes and failures of the Obama administration. If Obama stumbles, she likely would have an easier time making another run for the White House from the Senate. Here’s my question to you: What is the proper role for Hillary Clinton in President Obama's administration? 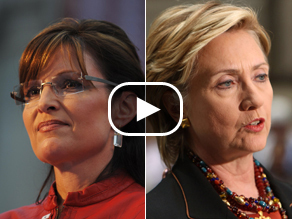 What does it say when Palin is meeting heads of state & Clinton hosts Farm Day? Vice Presidential hopeful and Alaska Governor Sarah Palin had a pretty full schedule today in New York, including meetings with Afghan president Hamid Karzai, Iraqi president Jalal Talabani and Colombian president Alvaro Uribe. Also on her dance card: Former Secretary of State Henry Kissinger and rock star-turned-humanitarian Bono. These folks are all in town for the fall session of the United Nation's General Assembly. In Washington, meanwhile, former Presidential hopeful Senator Hillary Clinton is having some high-powered meetings of her own. She is hosting the seventh annual New York Farm Day. The guest list, according to her office, includes: "producers of New York's award-winning wines, farm-fresh products, and fresh seafood." Who would have thought a couple of months ago that Clinton would be showcasing her state's agriculture industry while a first time governor and hockey mom who just got her passport last year would be meeting with heads of state at the UN? Here’s my question to you: What does it say that Sarah Palin is meeting with heads of state at the UN while Hillary Clinton is hosting Farm Day? Did Clintons deliver for Obama? It was pretty easy to see last night why Bill Clinton was elected president. When he's on, there's nobody better. The former president came out swinging, declaring that Obama is "ready to lead America and restore American leadership in the world." He rather cleverly pointed out that when he was running in 1992, critics said the same things about him as they say about Obama. "Too young, too inexperienced." Clinton said those criticisms didn't work against him then, and they won't work against Obama now because "he is on the right side of history". Like his wife, Clinton called on Hillary's 18 million supporters to vote for Obama. But he went even further than Hillary had, praising Obama's ability to inspire people, his intelligence and curiosity, his "clear grasp" of foreign policy, the strength he gained from the long primary season and his good judgment in choosing Joe Biden as his number two. And he did it all with a straight face. Bill Clinton ripped into John McCain, saying that after two terms of President Bush, "in this case, the third time is not the charm." Clinton cited a laundry list of Republican failures of the last 8 years, particularly the sinking image of America abroad: "People the world over have always been more impressed by the power of our example than by the example of power". Here’s my question to you: Did the Clintons deliver for Barack Obama? 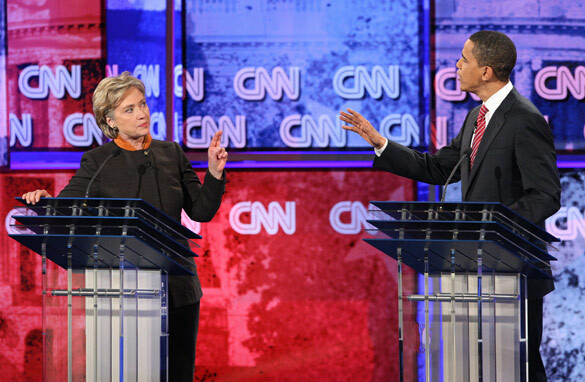 Can Hillary make the difference for Obama? If someone in the Obama camp doesn't turn this into a campaign slogan, they're not as smart as I thought they were. "No way. No how. 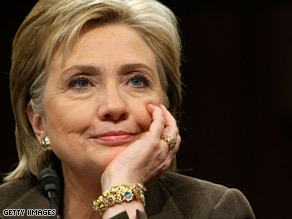 No McCain.” With those words, Hillary Clinton finally hit one out of the park last night for Barack Obama. Our John King got it right last night when he said Clinton is "a big game player" and this was a "big game speech." Clinton also lashed out at John McCain on the economy, health care, Social Security. Another good line: It makes sense that George Bush and John McCain will be together next week in the Twin Cities because these days they're awfully hard to tell apart. Watch: Cafferty: Can Hillary help? Joe Biden turned out to be "bounceless"in the polls but Barack Obama might just get one from Hillary. It was interesting that in her speech Clinton said she was honored to be there as a proud mother, Democrat, senator, American and Obama supporter. With her husband looking on in the audience - she made no mention of being a proud "wife." Hillary Clinton plans to attend Obama's acceptance speech at Invesco Field tomorrow night. But her husband is reportedly not going to be there. Bill Clinton speaks tonight… and while he's good, he'll have to bring his "A" game to top his wife's performance last evening. Here’s my question to you: When it comes to Barack Obama winning the White House, can Hillary Clinton make the difference? Hillary’s advisers skipping Obama speech? The Washington Post reports that some of Clinton's top advisers will be absent for Obama's speech on Thursday. Hillary Clinton is expected to be a cheerleader for party unity when she takes the stage tonight in Denver, but there may be less there than meets the eye. 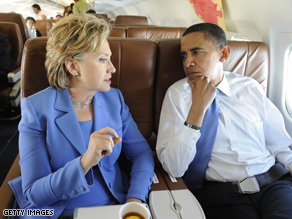 Reports are that tensions continue to run high between the Clinton and Obama camps. The Washington Post reports that some of Clinton's top advisers will leave town before Barack Obama accepts the party's nomination on Thursday night – that includes Terry McAuliffe who was Clinton's campaign manager. One Clinton supporter who is staying on for Obama's speech says it would be unrealistic to expect that there wouldn't be tension between the two groups... and that the convention is a good chance for the two groups to bond – which is hard if you're leaving Denver. Two longtime Clinton backers who are leaving early have excuses: one says it's for his daughter's weekend wedding and the other for an overseas business trip. Nonetheless, the Democratic Party is probably not as unified as Barack Obama and many others were hoping it would be at this point. Obama was forced to address reports that Hillary Clinton was never even vetted to be his running mate, saying he did in fact consider her. Meanwhile, John McCain is now out with his 4th ad using Hillary Clinton's words from the primaries against Barack Obama. The infamous 3 A.M. ad is back with the announcer intoning, "Hillary was right." This is not the way the Democrats drew this up. Here’s my question to you: What message does it send when some of Hillary Clinton's top advisers plan to skip Barack Obama's acceptance speech?